In the past, only glossier sheen paints were recommended for high moisture areas like bathrooms for their durability and easy-to-clean coatings. 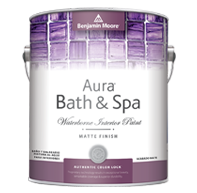 Now you can get these same benefits in a beautiful matte finish with Aura® Bath & Spa paint. Aura® Bath & Spa is part of an innovative paint and colorant system, integrating the best technologies to deliver superior durability for any color along with the promise of long lasting beauty. In addition to using 100% acrylic latex, proprietary resins have been incorporated to give this bathroom paint its extraordinary performance properties.